The P.J. Ferriolo Fund was established by his family in memory of P.J. Ferriolo who tragically lost his life in an airplane accident in October 1999. P.J. was a young man who was a late bloomer but had learned the value of a good education on the way towards accomplishing his dream of becoming a pilot. 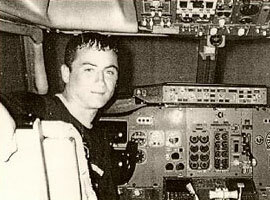 After his sudden death, his parents through a proper tribute to his memory would be an annual scholarship to be awarded to a graduating senior at Branford High School who had exhibited an interest in aeronautics, either flying or engineering. P.J.’s parents asked the Branford Community Foundation to be the vehicle for the collection and management of the funds. The response from the family and friends of P.J. and the community has been overwhelming. The first scholarship was awarded at the Branford High School graduation in June 2000.